Man, I love finding great shows hidden in the early 80’s! It’s like panning for gold, knowing that there’s so much to wade through, only to come across a ten pound handful of the precious stuff. I got a nice unassuming nudge in this show’s direction from a decades long friend who was in attendance for this one, sitting in the sweet spot, and feeling that spot most completely. His fond reflections made me immediately curious about the show. About thirty minutes later I had tracked down two masters on the archive and had them at the ready to ride. Tip of the hat to the good old Internet tubes for that! You’ll often hear about “dream set lists” if you hang out with tape collecting Deadheads long enough. We just like talking about this stuff. There are two kinds of dream set lists: actual, and fantasy. 09/06/83 can easily be describe as an actual dream set list. The planets just align for us. Challenged to create a 1983 set list yourself, this one would be somewhat of a long shot. But, if you’re going to get a Dupree’s, Bird Song, and Lazy Lightning in a 1983 first set, you know you are well on your way. When you follow up with a star studded, waste no time second set that tosses in an Uncle John’s and a Brokedown, you’re there. After warming up with some standards that sometimes manage to go to some twisted little off ramps (check the vocal weirdness on Peggy-O), the second half of the set begins with Bird Song. Ever the set one dose of wonderful, spacey exploration, Bird Song lives up to its reputation. It overflows with a crazy level of energy. Not frenetic are frenzied, but wildly crazy just the same. They push out all the boundaries imaginable. It is a dance that defies a body’s ability to express it, a symphony that has been written in six different directions. It is ever-lifting, and any time you think it might come down, it doesn’t. It’s wonderful. It will scramble your senses, leaving you ready for so much more. The Supplication borders on Other One intensity at times. A churning ball of cosmic fire, Bobby plays very aggressively. Brent hammers away. And Jerry is spot on as he seems to run a serpentine course in four dimensions, maybe five. At times his leads hover in the cloud of the other players’ sharp and pointed voices, Then he swoops out and down in impossible arcs to crackle like liquid lightning (nothing “lazy” here) across the face of the crowd. His seductive riffs beckon us to follow him back into the cloud, but the onslaught of the rest of the band is at times too intoxicating in its own right. We are left hopelessly at the mercy of the entire picture, unable to rest our eyes on just one color or abstract shape before it morphs into another. Set Two explodes with the opening Help>Slip>Frank. The Slipknot ambles beautifully in coolly flowing patterns which eventually find Bobby and Brent bathing the music is nearly blinding fog blankets of sound swells. These ease off, and Jerry’s slow motion corkscrew continues to draw us along from there. Franklin’s Tower is an awesome ride, stacking one better lead section on another. It goes in and out of the verses is like a warm summer storm that rises and falls on the wind as it passes overhead. 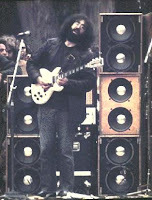 Eventually Jerry nears hurricane stature in the last solo, and beams of white hot light ignite the air around you. 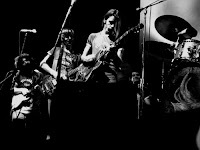 Then the storm recedes, leading us to an fantastically psychedelic and creative Playin’ In The Band. This Playin’ starts stretching it’s legs with Jerry working the wha wha in somewhat un-1983-like fashion. Under him, Brent is laying out huge moaning drones that fill the air with an endless expanse of timelessness. Phil works his way into this some as well. This is really nice stuff. Eventually Jerry settles into his more staccato lead style, and Brent works into a sound that feels like a wooded steel drum. Bobby is setting off flare-like bursts, and everything starts bobbing and weaving around you. Soon thereafter, Mickey is angling into a pre-Space style of drumming, smacking tones and riffs from impossible angles to the beat. Things are slipping so far from a traditional Playin’ jam, you have to wonder if they are cutting the jam short to let the drummers go. Not at all. Jerry rounds us all the way back to the Playin’ theme and the band draws to a hush. Now Billy is queuing the start of Drums. No doing. We’re barley half way through. From here the music cracks all molds and fractures into chaotic reflections of different dimensions. It grows more aggressive, and Phil is pulling some semi-frightening groans from the mountains around you. An unexpected melodic cohesion appears, and above it Bobby starts working a slide behind his guitar pickups. This produces bird like chirping that grows to subtle screaming. Then the entire mass of music flies out of any semblance of song structure. Bobby leads this weirdness too, with his own deep swelling dissonant groans. The music finally trails off leaving you on the shores of Drums and Space. A really nice Space takes form, as if the band was intrigued by the efforts in Playin’ and want to push things even further. Rather than sounding forced at all, everything works together very well. Jerry’s scales flow in more than sometimes meaningless directions, and around him wild swells of sound, like giant taffy rivers, crest their banks. 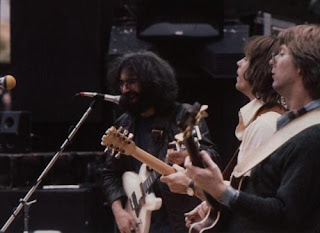 Things go from totally strange to eerily melodic with Bobby and Jerry settling into a duet. It floats back and forth from strange to subdued until eventually coming out on the other side into Uncle John’s Band. A winner in almost any show from any year, Uncle John’s begins a truly delightful post Drums/Space set of music. 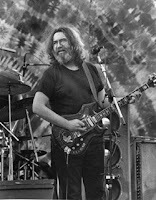 Just as we were wrapped in non-1983 passages during Playin’, UJB simply exudes all things Grateful Dead and defies simple assignment to any one year. It’s smile producing all around. The Playin’ reprise ties up the loose ends and drops directly into Throwing Stones. Not to be missed, the jam section of this tune departs everything remotely resembling the song itself (much like the Playin’ earlier). It’s short lived, but extremely unexpected and enthralling as the entire song is dismantled and lit on fire. Topping it off by nailing the return to the song proper, the band seems in no mood to let anything go off without some extra oomph. Not Fade Away doesn’t disappoint in this regard either. The energy is high, and the song high-steps along, brimming with energy. The crowd chants long after the band stops playing, on the way to the Brokedown Palace encore. This caps the evening with that ever loving embrace which pervades the joy of Grateful Dead music throughout time. This show strikes me as very special, and even more so when juxtaposed against the mainstream music of the day. It was the Summer of Flashdance, Dexy’s Midnight Runners, and right there at the top of the charts in September 1983, Men Without Hats’ Safety Dance. Nestled in the Red Rocks theater, I’d say it was a somewhat more preferable scene. The other recording up there, recorded with Sennheiser's, has a great sounding second set that offers a bit more midrange, if your tastes lean more this way. So, this recording and show carry with them a lot of great history. Not the least of which is a deep steeping in the mythical story telling of Grateful Dead tape legend and lore. 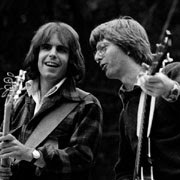 For this is one of the audience tapes that historically was said to have been recorded by the band (Phil Lesh in particular) from the stage itself. “Really?! Wow, that’s gotta be cool?” “Yeah, it’s probably one of the best audience recordings of the Dead ever.” Well, half of that story is true. It is absolutely one of the very best of the best AUDs. But Phil didn’t tape it. Phil didn’t make any tapes. Then there’s the well enough substantiated story that the band was higher than kites for this show. 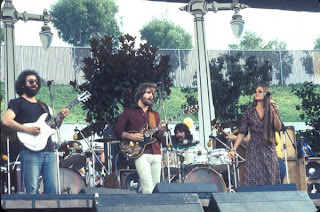 While it has always been very well understood that this band played under the influence of LSD many many many times, there are some shows that come to mind when Deadheads talk about shows where the band was “known” to have been chemically altered for sure: 08/27/72, 05/11/78, and 09/28/75 among them. So, this places an extra special sparkle to re-living the day’s concert when listening. Also, there is the fact that a baby was born during the show, with the band and stage announcers doing their best to help. Phil and Bobby can barely contain their desire to be pranksters. Next, before this century, if you weren’t in the most enshrined trading circles, you couldn’t find a complete copy of this AUD to save your life (and the real deal master itself only just went into circulation in May 2008). When you might have run into this recording (I was lucky enough to score 45 minutes of the show on cassette about 12 years ago), there was no way you could accept that it was an AUD at all. Clearly Phil and the band had to have had a hand in making this tape, right? It just sounded WAY too good. And there was the fact that there were a painful amount of right channel dropouts throughout the tape which allowed you to appreciate the quality, but never really left you wanting to listen to the tape again because of the pain involved in those dropouts. I’m not going to attempt to document the story of taper Bob Menke here on these pages. Let’s just say that BadBob (his own moniker) bleeds the history of Grateful Dead taping and collecting. He’s one of those fellows whose name lands in the inner circle when playing the dart game of Dead tapers. ‘Nuff said. Menke's story has been one of clouded half truths, misunderstandings, and mystery in the eyes of tape collectors. Over the last number of years, the real Bob Menke has made his way into the digital scene, so a lot of the mystery has faded. But, it sure did fuel the fires that made this particular tape one of such grand story telling. This is one to tell the grandkids about, to be sure. So Menke recently digitally transferred his master, and the MOTB crew finished it off with heroic editing (glad I didn’t face this task). And now we have this AUD for the ages, in its most beautiful glory. The recording is so good, it makes the AUD vs. SBD debate seem silly. It’s a little unfair, like bringing an NBA all star off the bench at a junior high basketball game. So much so, that it's fair for a SBD supporter to cry foul - “Oh, well, 09/28/75! You can’t talk to me about that show. That’s not fair.” Regardless, when you want to know what it might have sounded like pressed up against the stage for this hallmark Dead show in the year after they retired (you may never see them again), this is it my friends. Cripplingly good. Right out of the gate, the Help’s On The Way>Slipknot spins gold. The Slipknot casts sound colors into the air like a juggler balancing 30 balls in the air all at once with multiple sets of arms, a la some Hindu god. Everything weaves into everything else. The stand alone Franklin’s Tower is fantastic. 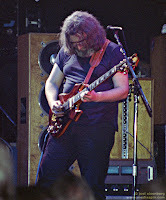 Jerry lets off a solo after the second verse that threatens to crack the sky with sheer force. It’s a towering mass of energy. During the a cappella portion of the song the band has you nestled in the palm of their hand. And, something that always makes an AUD all the more enjoyable is when an audience member shouts out some perfectly timed response to the music. It could be as simple as a woo! or a yeah! Here there’s a guy locked in and feeling it. His shouts will put a smile on your face. Bobby prophetically calls attention to the fact that he is going to completely blow the lyrics to Truckin’, and proceeds to do so in bewildered fashion. The jam takes a little bit to really get its legs. But once it does, it flies. The band catches that rocking, funking, winding groove reminiscent of 1974, and the jam rolls on and on. Each band member’s contribution comes through on the tape perfectly. Bobby’s punctuated string scraping shreds are beautiful. From Drums they go into King Solomon’s Marbles. I must say that it sounds like the challenge of the band’s collective mental state becomes slightly more apparent in the intricate passages of this song. However, nothing fundamentally falls apart, and the slightly unfurling edges add to the psychedelic mystery. But things are probably not as tight as the band would prefer. Still, this version is as pleasing as any other from 1975. When they lock into the 7/8 time signature and let the solos take form, you feel the rug slip deliciously out from under your feet. The snaking rhythm coils in every direction, riding the wind and circling the clouds. 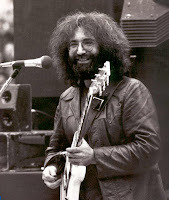 From here there is a loose transition into Not Fade Away, Jerry seems to hang on a string bending note like he’s clinging to the edge of the world hoping not to fall off. His solos that follow are full of a certain slow burning energy, lots of massive notes that push against each other like saturated balloons. It makes for some very nice listening. The Goin’ Down The Road smacks of good old Grateful Dead, everyone having a good old time. This is a sensational field recording, documenting not just the music, but a whole lot more. It’s great to finally have this master tape available in its full splendor. Thank you, Menke. This audience tape is of the breed that gives off unparalleled energy. Outdoor, sitting in the sweet spot, if you want to hear the pure might of the Dead’s sound system in 1976 then look no further. The band’s power on this date defies all stereotypes associated with the shows of this year. Virtually everything will blow your hair back. The sound stands as tall as a skyscraper in front of you. And while the tape comes with a plethora of raucous outdoor audience enhancements (everyone is having a grand time), over it all the music on this tape simply explodes. It’s not sonically perfect, but most of the tapes that share this characteristic are not (see 05/12/74.) This tape does have ample low and high end which, coupled with its clarity, makes for a very enjoyable listen. The show opens with a Might As Well that lets us know that the band is already on a pretty serious high. And loud. Things are really really loud. It feels great. Jerry’s steel-necked Travis Bean guitar seems to be vibrating electricity at every turn. I can’t recall it ever sounding quite as nice. And he finds the pocket on most every single song. The solos are all peppered with a little something extra. Likely, as good as it sounds in the crowd, the band’s monitors are equally cranking for the outdoor setting. Having played on outdoor stages many a time myself, I know that when these things are perfectly set you can really lose yourself in the bowl of sound rising off the floor around you. It all leads to the sensation that the music plays the band. They are just relaxing into the entire experience, and hitting it out of the park time and time again. Jerry is spinning pure gold all day long. Virtually everything in set one delivers the goods. Do not pass up the Ramble On Rose which features the fantastic echoing of the vocals from the back of the stadium. It’s a really cool effect, not to mention Jerry's howling delivery of the “Goodbye mama and papa” line. Wow. And even if you feel like you never have to hear another Promised Land again until the day you die, you might want this to be the one you hear when that day comes. 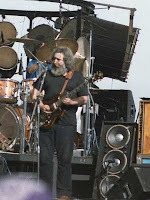 Jerry’s final solo run starts off with an ascending run that goes over the top, a complete embodiment of the entire first set’s energy. And one of only three West Coast performances of Friend Of The Devil in 1976 (with its new slowed tempo) provides a needed breathings space for everyone. 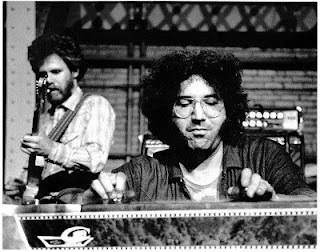 The set closing Dancin’>Wharf Rat>Dancin’ is a sweet set ending treat. As I've probably pointed out before, the devoted deadheads of the day might have been shaking their heads as the song kicked off in the pure disco stylings of the day, but in retrospect we can easily lock into the groove. The band pounds things out in synch with the already charged energy. Jerry sets off into the solo section under Phil’s snaky popping bass runs. Bobby syncopates the rhythm. And what follows is good times Grateful Dead. After a time the band cools. Jerry rolls way off on the high end and begins weaving his licks around the stadium in slow moving curves. 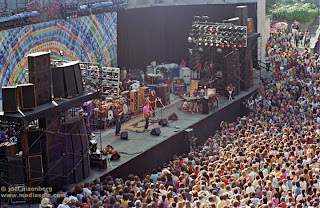 He then lifts into the air with a few high note bends, and the band lands in a tightly pocketed section which settles even further as they spin down into Wharf Rat. This transitional pairing saw a total of 7 incarnations, 6 of them in 1976. Jerry offers a bit of slide work, and the Dacnin’ has been completely left in the past. Or has it? Bobby and Keith seem of a mind to return, and Jerry takes the bait, speeding his solos. But this then becomes something like the feeling of easing the radio dial between two stations that are on nearly the same band. Like two watercolors drying into each other, Dancin’ comes and goes, the spacier jam appears and disappears, and after a nice period of this back and forth we arive at Wharf Rat. 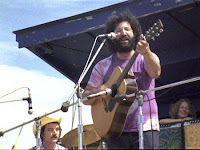 Jerry offers towering solos out of the song which stand like majestic gigantic redwoods all around you. Bobby deftly brings the band back to Dancin’ and they cook through the chord change arrangement section perfectly. The set ends. The sun is shining at midday. 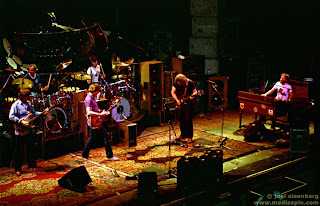 The big set two jam is another 1976 set that looks amazing on paper. They were really pushing themselves in creative directions. The performance is up to the task, and does not disappoint. Playin’ In The Band rolls into the jam and the quintessential 1976 playing style takes form. Giant wagon wheels the size of galaxies, formed more out of multi-colored gossamer syrup than wood, begin slowly spinning into each other under your feet for as far as you can see. Here again we find the magic of a 1974 Playin' bleeding into the years after. It’s deeply psychedelic jazziness pervades the band’s mind bending meanderings. Coolly the band slips into Drums. This Drums is short and sweet. Near the end, the drummers hint at Other One and the crowd catches this and cheers. However, whether by a last minute redirect or a forgotten pre-determined set list, the Other One is not meant to be (yet). The hallmark drum intro to The Wheel quickly forms and moves things along. This song was such a nice addition to the lineup in 1976 and came to embody part of the real “feel” of ’76 shows. This day’s version has it in spades. The Wheel makes a sensationally invisible transition from post-Wheel lilting music into a deep Space blow out. As great as the Playin' jam was, I think this post-Wheel jam is even better. This goes into a short Drums followed by the entire energy of the whole show peaking with Other One. This is a take no prisoners version, chugging along with an almost evil grin. Burning white hot electricity blows you back like a ferocious wind storm. Our continually somewhat vocal neighbors around the taper are gasping and chuckling in complete rapture. The music speeds on and on, taking us hurdling down twisted pinhole fissures in interlocking caverns formed by the erosive power of torrential rushing energy through the landscape of consciousness. Did I mention it takes no prisoners? This is yet another satori moment, almost brutally grabbing you by the throat and aiming your senses directly at the band. You can barely remember to breath. And then, because this band had a knack for tapping into the loving center of the elevated conscious experience, rather than opting to play with the fragile psyches in their grip, they let the horizon balance and wind subside on the shores of a Stella Blue. The song emanates grace, safety, and warmth. It’s a very welcome stabilizer, which tips right over its own edge back into the forest of impossibly colored trees and iridescent rivers. A jam comes back which finds the band moving more slowly through the caverns they sped through minutes earlier on the return trip to Playin’ In The Band. Playin’ reaches its crescendos, capping a fantastic set two jam sandwich. Sugar Magnolia seems a most appropriate set closer. This is a wonderful listening experience that surprised me in being even better than I remember when I decided to revisit it in consideration for the blog. Worth returning to again and again, and definately from the opening notes on.